I don't know what kind of press the protests in Thailand are getting in the western world, but I just wanted to let everyone know that we're safe and sound. 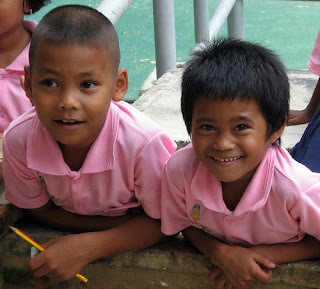 We're in Khao Lak now, where we just finished up our two weeks of volunteering. It was a fantastic experience. We're heading to a couple of the Thai islands this week and then we go to Cambodia to begin our volunteer stint with WLS. Until our next update, I leave you with this adorable, giggly duo that we met the other day.